Bed Frame and Mattress Deals. 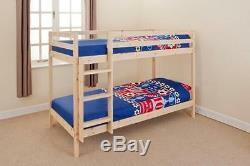 Wooden Bunk Bed Kids Childrens 3ft Single with Matress options in white or pine. BUNK BED - SOLID PINE FRAME. 3FT SINGLE BUNK IN NATURAL PINE OR WHITE WASH. WITH OR WITHOUT 2 LUCY MATTRESSES INCLUDED. The Zara Bunk is made from solid sturdy pine available with a natural finish, or with a white wash. The bunk features fixed slatted bases to provide rigidity and support, with slatted headboard and foot boards. An adjustable ladder is positioned on the left side but can be alternately positioned on the right instead to fit in with your requirements. THIS BUNK DOES NOT SPLIT INTO 2 BEDS. Included into this listing you can add 2 mattresses to be delivered with your bunk. The mattresses are the UK Manufactured'Lucy' brand. These are optional, please choose from the drop down menu above. This bed comes flat packed for simple home assembly, all tools and instructions included. Please be advised that mattresses may be delivered rolled. This will not affect the quality of the product. To ensure your new furniture is suitable for your home, please remember to measure your available space before ordering. BUNK DIMENSIONS: L198cm x W99cm x H141cm. 13.5 gauge open coil spring system. PLEASE BE ADVISED THAT ALL DIMENSIONS ARE APPROXIMATE, PLEASE ALLOW ROOM FOR SLIGHT VARIATIONS. Over the past few years we have been developing our range of products to enable us to supply consumers with furniture at the absolutely lowest prices possible. We do not have the large overheads that shops and large retail chains have so we can keep our prices low and pass all the savings onto our customers. Cloud Nine Furniture prides itself on its excellent prices and customer service. We invite you to look at our products and pricing and compare them with any other website or shop. We don't believe that you will find a better deal anywhere else which is why we are not able to offer discounts on multiple items. See our terms and conditions for details. All prices include VAT - Registration Number GB166779256. We cannot process telephone payments. The office is closed at weekends and bank holidays. We only deliver to the UK. Unfortunately we are UNABLE to give more specific time slots. Messages sent on Fridays/Weekends will be responded to on Mondays (Bank Holiday exceptions). Please do not send DUPLICATE messages as this duplicates our work and adds to the message response time. All messages are responded to in time and date order, thank you for your patience. Please note the courier drivers are not insured to carry items upstairs/into a property. We are unable to compensate for delayed deliveries. We can only accept products for return with their original packaging in the condition they were delivered. This does not apply to products which are faulty - these will be collected/replaced free of charge. The more info you supply us with the quicker we will be able to rectify the issue. Please however beware of the following. Mattresses, Chair Beds and Beds. As with nearly all mattress retailers we are unable to accept "used" mattresses for return for health and hygiene reasons. By "used" we mean mattresses that have been removed from their original packaging. Flat packed furniture As with nearly all furniture retailers we are unable to accept flat packed furniture that has been erected or semi-erected. Please Note: Unwanted orders will be collected subject to a &###xA3;15-&###xA3;30 charge depending on your order (to cover the carrier's charges), this does not apply to products which are faulty - these will be collected/replaced free of charge. We will then be able to assist you in either sending replacement parts or a new product. This listing is currently undergoing maintenance, we apologise for any inconvenience caused. The item "Wooden Bunk Bed Kids Childrens 3ft Single with Matress options in white or pine" is in sale since Wednesday, June 6, 2012. This item is in the category "Home, Furniture & DIY\Furniture\Beds & Mattresses\Beds with Mattresses". The seller is "cloud_nine_furniture" and is located in Bridgwater.